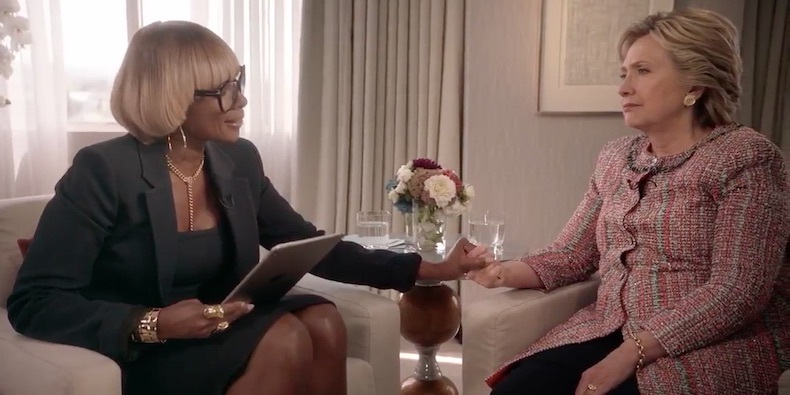 Monday night after the first 2016 presidential debate, Mary J. Blige released a teaser for a potentially awkward interview with presidential hopeful Hillary Clinton. Dressed like she was hosting ‘The Cripsy Chicken Report on Oprah’s OWN NETWORK’, Blige is featured bizarrely singing at Clinton about respectability politics and possibly what’s in the new chicken wrap. We aren’t too sure. She awkwardly sings to Clinton as Clinton stares back at her just as confused as we are. The interview will be an apple music exclusive for Blige’s show The 411 and promises to show both Blige and Clinton “as you’ve never seen them before” when it arrives on September 30th.